"More Visitors From National Sports Festival, ILC (Training for Tanko Area Taxi Drivers)"
So as to relay the charms of the area to visitors of Tanko area, the Oshu-Kanegasaki Tourist Guide Taxi Steering Committee (President Yukinobu Ono) is conducting training for tourist guide taxi drivers. Taxi drivers are expected to have more chances in the future to interact with visitors from within and without the country due to large scale projects and events like the ILC and Iwate`s hosting of the National Sports Festival. The business world is coming together to train for pleasant customer service and to promote local charms to the world. The committee was formed April this year by the Tanko branch of the Iwate Taxi Association. The drivers who undergo the three part training and lecture series by October will be certified as tourist guide taxi drivers. 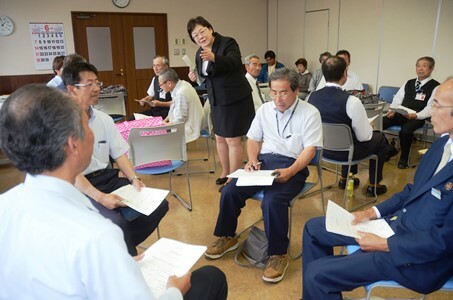 The first training was held in Mizusawa recently after the committee was set up, with 34 people from six taxi companies in Tanko area participating. The participants learned about well-known tourist destinations in Mizusawa and local products, as well as customer service techniques. Ms. Akiko Osawa of Office Madoka in Hachinohe, Aomori explained about customer service techniques: People who come to a place for the first time have hopes and worries, and it`s important to quickly sense from the customer what she or she wants. *Translation by Oshu city ILC Promotion Division . . Copyright (c) 2010 Tanko Nichinichi Shinbunsya All Rights Reserved.